As the Terrigen Clouds move around the world they leave in their wake the wrecked lives of the Inhumanized. Crystal and her team are tasked to help as many of these NuHumans as possible, but it’s not going to be easy. Not only are views of these new super-powered people varied (from fear to anger to amazement) but even those who get the powers aren’t always glad to get them. Add to that the nineteen mysterious Skyspears that recently crashed into the Earth, and the Inhuman world just got a lot more complicated. Staring Black Superhero Flint! They’re each the sole survivor of a lost Earth and they’ll do anything to protect this one, whether you like it or not. The Squadron Supreme — comprising Hyperion (Avengers), Nighthawk (Supreme Power), Dr. Spectrum (the Great Society), Blur (DP7) and Power Princess — are a team that doesn’t ask permission or what the rules are. To them all that matters is the safety of Earth and if you stand in the way…that’s your problem! Tell that to the Squadron’s first target — Namor, destroyer of Dr. Spectrum’s homeworld, who will have to pay for his crimes…but at what cost to the people of Atlantis. Stars Nighthawk and Blur. 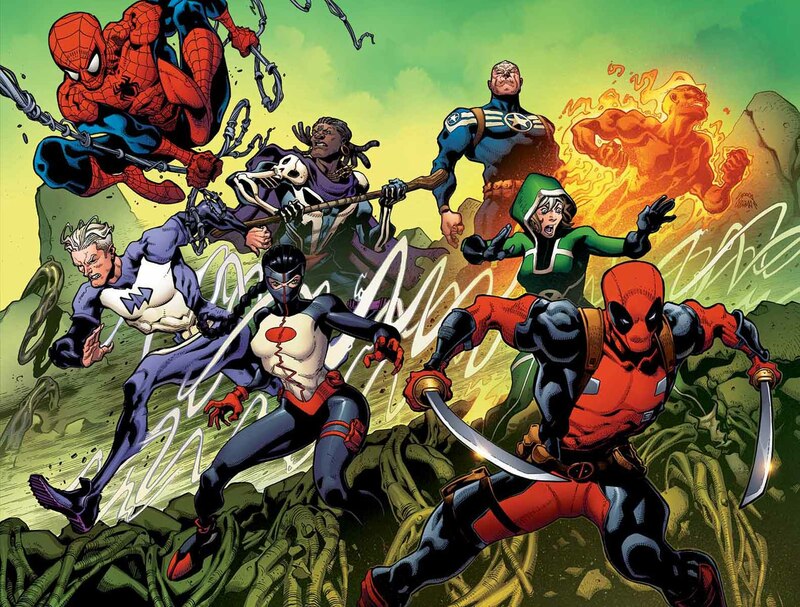 How do the villains of the Marvel Universe live in a world where the sky is constantly filled with heroes? What do they do when they want out of that life? There is no escape. No future. Who saves the villains? The Hood believes he might be that savior. He wants everyone to have a place at the table. Now all he needs to do is build his army… Featuring Titania, Mad Thinker, Thunderball, Black Ant and Enchantress, Illuminati is a tale of villains just trying to survive in the All-New All-Different Marvel Universe. Stars Black Supervillain Thunderball! The ultimate superteam comes together to find and fix problems beyond the limits of the infinite! From cosmic forces lurking on Earth to what waits on the outside of the omniverse – the impossible is where they start! And what’s more impossible than ending the threat of Galactus, the devourer of worlds… forever? 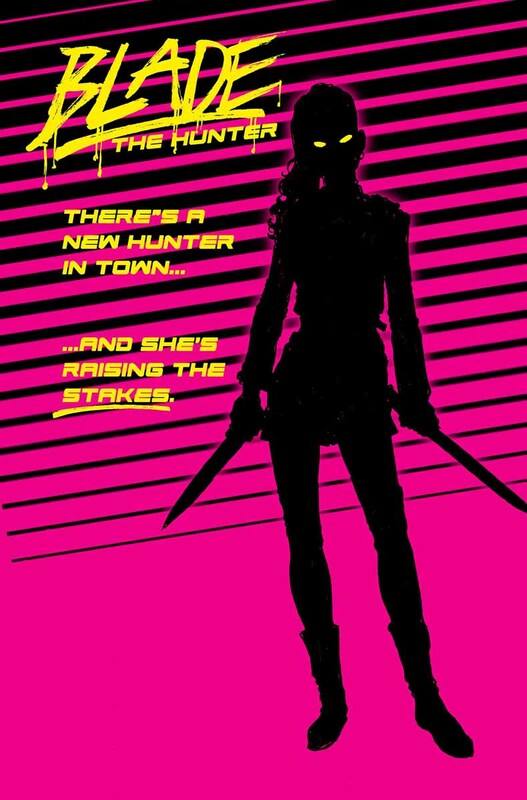 There’s a new hunter in town and she’s raising the stakes! EVERYTHING IS NEW. In the wake of SECRET WARS, the old order changeth – and Bobby DaCosta, Sunspot, is just the man to changeth it. Welcome to AVENGERS IDEA MECHANICS – a super-scientific global rescue squad of tomorrow’s heroes… today! America doesn’t want them! S.H.I.E.L.D. doesn’t know what to do with them! But Earth might not survive without… the NEW AVENGERS! 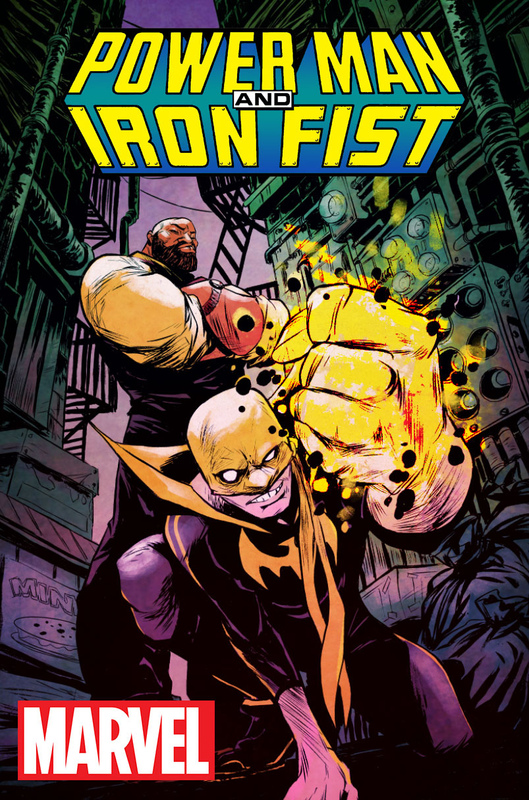 Power Man and Ava Ayala will also be in this book! New team, same mission. Steve Rogers has formed a new Avengers unity squad compromised of humans, mutants and…Inhumans? A new threat to the Avengers is revealed. Wait, is that Deadpool on the cover? Is he seriously an Avenger now? DR. Voodoo stars! “A NATION UNDER OUR FEET” The story that will re-position the Black Panther in the minds of the modern comic fan. Wakanda has always been a Monarchy but that will all change if “The People” a superhuman uprising has anything to say about it. They incite a violent uprising among the battered people of Wakanda after Avengers Vs X-men, Infinity etc. Can T’challa stop them and save his nation?! Cover by YASMINE PUTRI On Sale in December! They are beings of unspeakable power. Former Avengers and cosmic entities that have defended Earth from the far reaches of the cosmos. This December, they return from outer space to embark on the adventure of a lifetime – going to college! Today, Marvel is pleased to announce STARBRAND & NIGHTMASK #1 – a brand new ongoing series from critically acclaimed writer Greg Weisman (Star Wars: Kanan) and rising star artist Domo Stanton (Deadpool)! I am looking forward to the Squadron Supreme, and perhaps either the Ultimates or the Black Panther. I know David Walker is doing the Power Man/Iron Fist, but I think I am going to wait on his Shaft series to drop from Dynamite. Diversity, about time, now let’s see some quality work. Question, if one to two Black heroes are on a team is that an invasion? Just asking.